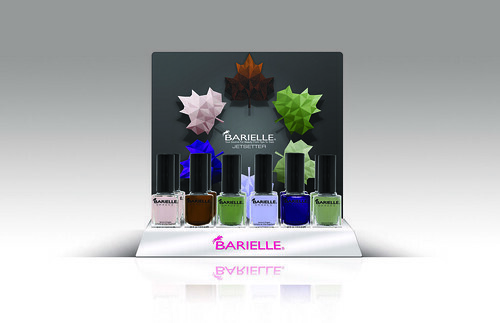 Available NOW, a gorgeous 6 piece collex by Barielle. I received these as samples and will be showing them to you soon. They are just stunnning! Press Release, Holiday 2014: China Glaze: Twinkle Collection! ‘Tis the season for gathering with friends and loved ones, and dreaming of the future. This holiday season China Glaze® introduces Twinkle, a collection of shades that perfectly capture the spirit of the season, sparkles in the night sky created by glowing lights, the softness of fresh snowfall and visions of the new year. With 11 new shades and one special effects top coat, China Glaze® Twinkle collection also features nail art kits and gift sets perfect for gifting the manicure addict in your life. Make this holiday one to remember with the China Glaze® Twinkle collection, available in November 2014 at fine beauty supply stores and salons nationwide including Sally Beauty and Ulta (individual shades MSRP $7.50). For more information, please visit www.chinaglaze.com or follow China Glaze on Facebook (@ChinaGlaze), Instagram (@ChinaGlazeOfficial), Twitter (@ChinaGlaze) and Pinterest (pinterest.com/chinaglaze). #ChinaGlazeTwinkle. Wishes really do come true with this magical new nail polish collection for Winter/Holiday 2014! Zoya Wishes** is a densely pigmented assortment featuring both traditional and Magical PixieDust formulas in coordinating color combinations that can be worn alone or combined into stunning combinations, no matter how you wear them, this collection delivers a fanciful way to celebrate the season! · ZP766 - NORI: Sapphire blue Magical PixieDust* with holographic hex glitter, perfect for any holiday festivity. · ZP767 - THEA: Deep amethyst Magical PixieDust* with an orchid flash, packed full of party-ready holographic hex glitter. · ZP768 - IMOGEN: Black crystal Magical PixieDust* with holographic hex glitter, just add an LBD and you’re off! · ZP769 - PRIM: Velvet blue metallic, with a full coverage, high-density pigment and buttery smooth application. · ZP770 - HAVEN: True holiday plum liquid metal with a thin vein of orchid for added brilliance. · ZP771 - WILLA: Full-coverage, onyx black cream. * Zoya Magical PixieDust is textured, matte and sparkling. No base coat and top coat required. China Glaze recently released their 2014 Halloween collection, creatively called the Apocalypse Of Color collection. There are 5 polishes and a glow in the dark topcoat, which I believe is a re-release. Group shot! First up, the red and green polishes (which seem kinda odd for Halloween, right?) are similar in formula. Both are creme polishes with black matte glitters. They look like they should be texture polishes and they kind of dry like it, too. I did three thin coats of polish, no topcoat. Rest In Pieces is a gold glitter topcoat, full of bars and hex. This is 2-3 smooshed on coats. It is very base heavy but the result is really pretty. I think this would look great for New Years, too. Last but not least, my favorite of the collection is Don't Let The Dead Bite, a pink base with red glitters. It seemed sheer with the first coat, but this is 3 thin coats and it built up really nicely. I love this one, are you surprised? I hope you enjoyed this collection. I did! I apologize for no GITD pic, I am still learning with those pics..I'll post on one Instgram as soon as I can take one, LOL. As a whole it is kind of a mish mosh, but all of the polishes lend themselves to other holidays, too. Very versatile! Which was your favorite? Ooh, ohh, I am so excited for today's post! I have been obsessing over Hare Polish for a while now and Dancing Birds of Paradise was a polish I was completly lusting after. So sparkly it freaked out my camera a little! This is three thin coats. Because it has a jelly base and because I cannot stand a VNL (visible nail line), I did use three coats, but you can probably get away with two. Gorgeous, right!? Screams SUMMER and FLAMINGO and all kinds of goodness! Pretty & Polished To Be A Lady is a polish that I received from a friend (Thanks, Jess S!) and, for some reason, it went untried for a while! I really don't know why it hung out in my untried pile...it's an indie, a pink based crelly, and super girly - those are my favorite polish characteristics! LOL. I am glad I finally used it though, because it is puuurty. The bottle came to me label-less, so I googled a bit and easily figured out what it was. It came out in the summer of 2013 and was part of the Sweet Sixteen collection, which had 3 polishes total. I don't have any other polishes by Pretty & Polished, so this is my first time trying the brand. The crelly is a good formula, easy to work with and builds to opacity in 3 thin coats. Even chock full of glitters, the consistency is not thick at all. The big glitters came out with little effort but I did push and place the biggest ones. The smaller glitters came out easy as well and required no placement. I was checking out their store and unfortunatley, I don't see To Be A Lady anymore, but they do have other pink based glitter filled crellies, so there are so beauties to check out. Pink and holo and Aussie and decals...oh maaaan, I am psyched for this post. Picture first, then explanation! She also sent me some cool chevron decals, which I used Salon Perfect Sugar Cube as the base and Rose Dawn over top. The monogram decals are custom made from Moonworks Emporium. I ordered black and pink decals. They aren't that easy to use...make sure your base color is dry, dry, DRY before attempting to adhere the decals. Today I have posts from an indie company so new that the store isn't even open yet! Pre-orders from Dragon Claw Polish will begin on November 7th - but you can see swatching of one of the three premier collections right here and right now! I was sent the 5 piece collection called Toys Everywhere! which is inspired by maker Janet's 7 children and her busy, happy, toy-filled home. I am going to show you 4 of the 5 polishes today (which Janet tweaks the 5th a little bit). There are a couple knockout polishes in this collection so let's get to the pics! First up, this is Chewy Rainbow Bands, a neon pink jelly with assorted rainbow glitters. This polish is inspired by Janet's daughter who loves her Rainbow Loom...and her baby, who finds the discarded bands, LOL. I used three coats alone for these swatches, with topcoat. The jelly is squishy, sheer, and bright, everything you look for in a jelly. The rainbow glitters come out of the polish easily. Dry time is longer than a creme, but it's a jelly, so you already knew that! I wanted to see this over a solid hot pink, so I put two coats over Nire's Desire unnamed pink creme. I love how the neon glitters stand out on top of the pink. This is one bright mani! Next, this polish is Crayons On My Wall, a delicate lilac that seems to change color to silver in certain lights. It has a slight holo to it, too. This is three thin coats with topcoat. The polish applies well and dries quickly. Nice! The inspiration comes from the drawings and artwork that Janet saves and pins up on the wall. The third polish I have to show you is called DonaRaphLeoAngelo, and I am sure you can figure out the inspiration for this one! This color shifter slides from maroon, green, silver, and even a blue in certain lights. I did three coats and topcoat for these swatches. The formula is great, zero issues! Last but not least, this is the standout of the collection, in my opinion, and my favorite, by far. Red Bouncy Ball is a squishy red jelly with a gorgeous gold shimmer. I did three coats and topcoat for these swatches. The formula is excellent and it dried surprisingly quickly! The inspiration comes from a favorite toy in Janet's house, which is red and lights up. The shimmer captures the inspiration perfectly! Like the other jelly, I wanted to swatch this over a solid to capture the jelly and the sparkle. I used Orly Sweet Tart, which, to my surprise, is a jelly, too. I know this would look even more vibrant over a red creme but I had committed to this color, LOL. Loove how vibrant this is over a solid red. This baby went on my Favorites shelf so I know to grab it again soon! Remember, pre-order starts November 7th! My fave, by far, is Red Bouncy Ball. The shimmer is gorgeous, the jelly consistency is squishy and perfect, and this is just lovely for the upcoming holidays.